As one of those top-notch artists whose career started from a very tender age, Bobby Brown was just was three when he had his first taste of the spotlight while one of his childhood idols, James Brown, performed in Boston. The performance sparked his dream of becoming a singer, leading Brown to join the church choir, where he recognized and developed his singing abilities. Today, he’s renowned as an American singer, songwriter, dancer, and rapper. Born in Boston Massachusetts on February 5, 1969, Brown proved to be talented at a very young age. He joined a church choir group which helped him hone his singing abilities. In 1978, at the age of 9, he began his music career with the pop group “New Edition” which he founded with his friends. After performing in several talent shows, the group won a recording deal with Maurice Starr’s label. They released their debut album “Candy Girl” in 1983 which immediately sold millions of copies. Their self-titled sophomore album was even more successful. Hits from the album included “Mr Telephone Man” and “Cool it Now”. After a string of controversies and disagreement within the group, Bobby left them in 1985 and went solo. However, he has since reconciled with New Edition and has performed a number of shows together with his bandmates. As a solo artist, he signed with MCA and released his debut solo album “King of Stage” in 1986. Though the single “Girlfriend” performed well on the charts, the same couldn’t be said for the album itself. He released his sophomore album “Don’t Be Cruel” in 1988. 5 songs from the album made it to the top of Billboard 100. It produced singles such as “Every Little Step”, “Don’t be Cruel”, and his signature hit “My Prerogative”. The album sold 12 million copies globally. It was certified platinum 7 times by the RIAA. In 1990, he received his first Grammy award for the best R&B vocal performance. Bobby went on to release three other albums – “Bobby” (1992), sold about 3 million copies, a far cry from the success of its predecessor. His fourth album “Forever” (1997) performed worse than the previous with no successful single. He received features from many other artists before releasing his fifth album “Masterpiece” (2012) which debuted at #41 at the R&B album chart. In 1992 Bobby tied the knot with legendary pop star Whitney Houston and together the songbirds released a duet “Something In Common” which topped the UK charts. During his active music career, Bobby also starred in a number of movies. His debut acting was in the 1989 movie “Ghostbusters II” for which he also provided the soundtrack. His other notable roles include “A Thin Line Between Love And Hate” (1996), “Go For Broke” (2002) and “Nora’s Hair Saloon” and its sequel (2004, 2008). Aside from his acclaimed musical prowess, Bobby Brown is also famous for his troubled marriage to Whitney Houston which caused his name to hog the headlines for the wrong reasons in the past. 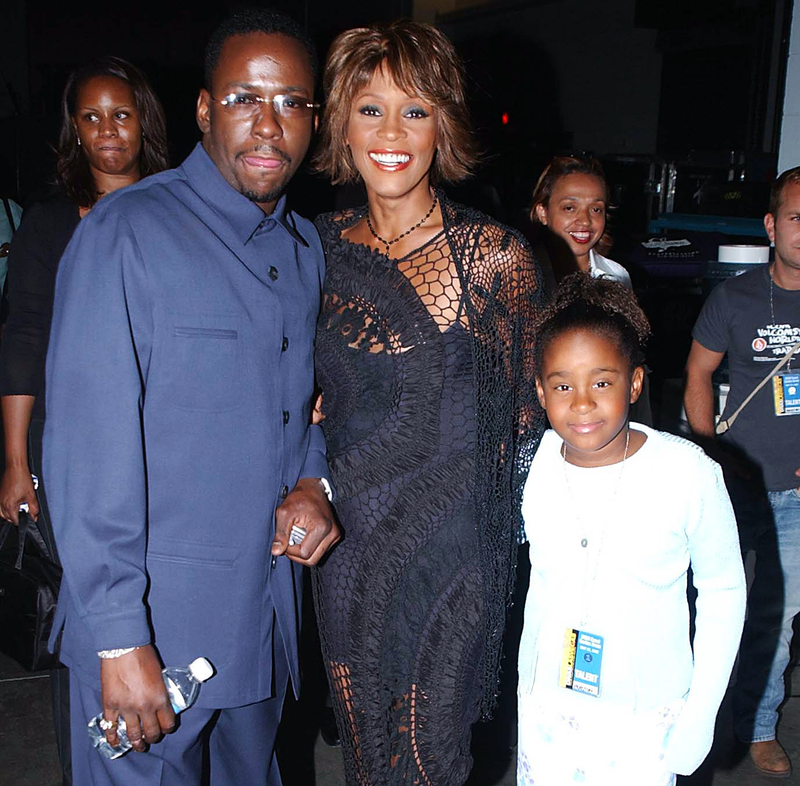 Bobby Brown was married to the legendary Whitney Houston from 1992 to 2007. After 14 years of marriage, their divorce was finalized. Their marriage produced a daughter Bobbi Kristina Brown who was born in 1993. In 2015, she was found unconscious in her bathtub. She later died at the hospital as a result of low brain activity. Notably, she followed the same path of substance abuse that wrecked her mother’s career and life. In 2009, Bobby began dating Alicia Etheredge. After three years, he married her in Hawaii. Alicia is also his manager. Among his other children are LaPrincia, Landon, Bobby Jr. and Cassius. On the long run, his marriage to Whitney couldn’t salvage his career. Brown’s poor performance was exacerbated by unending problems with the law, as well as an alleged mental illness. He has been arrested severally for violations including, driving under the influence, drug possession, battery and refusal to pay child support. Currently, the musician is struggling to pick up the pieces of his life, as he continues to work on his music. Amid challenges and massive career decline, the entertainer still makes money from his past glory. For the most part, he has reportedly earned quite a bit of money estimated to be around 400,000 dollars each year since 2013. Most part of his income comes from New Edition royalties, solo career royalties, and various acting jobs. As of 2017, Bobby Brown’s wealth is estimated to be $2 million.